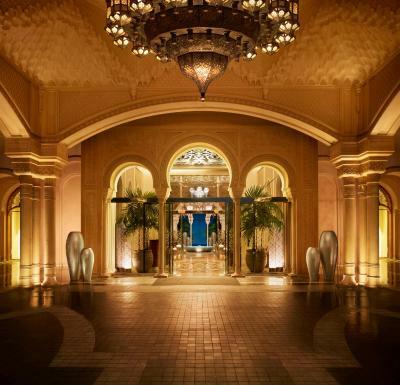 Lock in a great price for One&Only The Palm Dubai – rated 9.4 by recent guests! 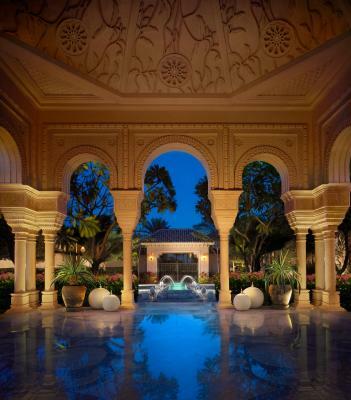 Simply the most beautiful lobby and pool area. Gives you a feeling of paradise. My husband and I had the pleasure of having an amazing host Russell who accommodated all our needs and over the staff is super friendly and amazing. The property really makes you feel like royalty. Everything was elegant. The mansion rooms were very spacious and only a few steps away from the beach. Breakfast was excellent. The spa is a must visit. Everything was spectacular and they "pampered" us well. A wonderfull place, very friendly and helpfull staff. This is an extraordinary resort. The facility, staff and service were exceptional. The included breakfast was great. Eggs extraordinary and beds like fluffy clouds plus the nicest and most endearing staff. One&Only The Palm Dubai This rating is a reflection of how the property compares to the industry standard when it comes to price, facilities and services available. It's based on a self-evaluation by the property. Use this rating to help choose your stay! 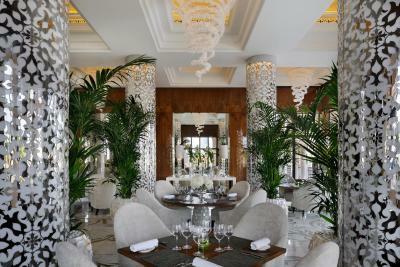 One&Only The Palm offers luxurious beach-front accommodations on Palm Jumeirah's peninsula. Guests can enjoy panoramic views, a private beach and cuisine by Michelin-starred chef Yannick Alléno. The One&Only features spacious rooms, suites and villas that are either located within the hotel’s Manor House or in private Beach Villas. 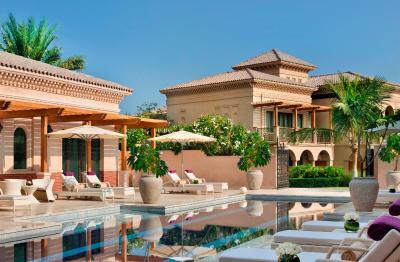 The rooms and suites overlook the main pool and the palm-shaded terraces. The Beach Villas offer direct beach access and personalized service. 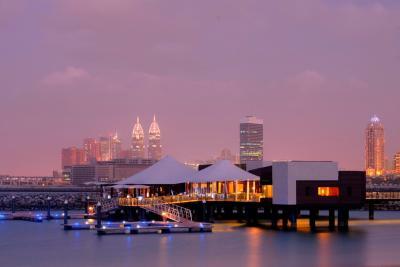 Guests have a choice of 3 restaurants, which includes the over-water Marina Restaurant, Bar & Lounge. 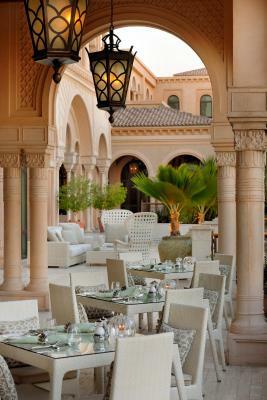 Guests can also venture out by water taxi to the One&Only Royal Mirage to have dinner at any of its 7 restaurants. Activities include golfing, water sports and excursions. The resort's One&Only Spa is set amid outdoor gardens and features its own pool and 8 private treatment suites. IMG World and Hub Zero Dubai are just a 35-minute drive from the property. 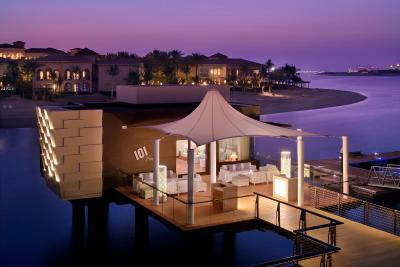 When would you like to stay at One&Only The Palm Dubai? This room features a private balcony or a patio. It includes a sitting area with a sofa and flat-screen cable TV. Open-plan suite offering a living area, spacious bathroom with spa bathtub and a furnished outdoor balcony or patio. Steps from the beach and offers a private balcony or beachfront patio with outdoor seating. 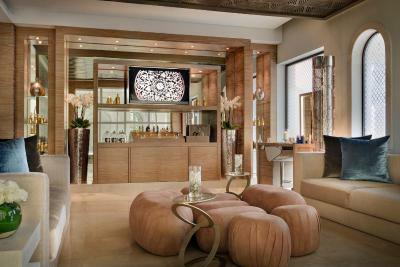 This room is decorated with contemporary chic design with a taste of Arabia. This room includes a private balcony or garden patio. Located within the main Manor House, this room has two separate queen beds and a spacious living space with a chic, contemporary design with a subtle hint of Arabia. The room also has a multimedia entertainment system with a satellite flat screen TV, a DVD/CD player, and either a private balcony or a garden patio. This very spacious room is steps away from the beach, and most rooms feature a sea view. 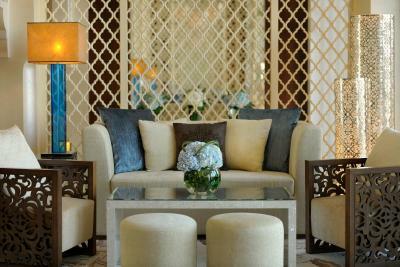 Each room has a private balcony or beachfront garden patio, furnished with elegant outdoor sitting. The room also includes a flat-screen satellite TV and a DVD player. 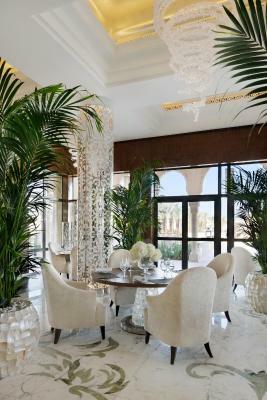 House Rules One&Only The Palm Dubai takes special requests – add in the next step! 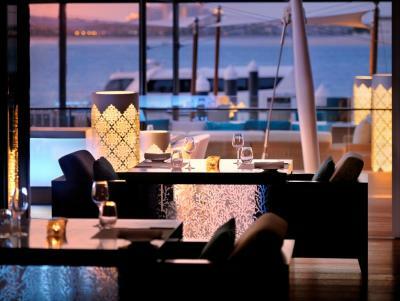 One&amp;Only The Palm Dubai accepts these cards and reserves the right to temporarily hold an amount prior to arrival. 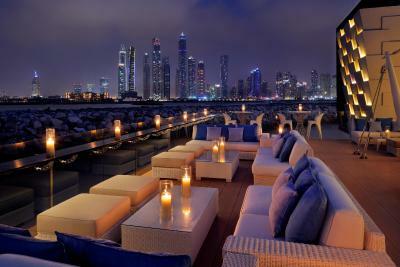 One&Only The Palm Dubai accepts these cards and reserves the right to temporarily hold an amount prior to arrival. Almost everything, very helpful staff, the concierge was always very accommodating with our requests. The Breakfast selection was excellent, one of the best. beautiful hotel, all in style with the middle east. Super swimming pool setting. Location is quite at the end of the palm, but still with great view on all of the Dubai action! This place is heaven. Every little thing is thought off carefully. 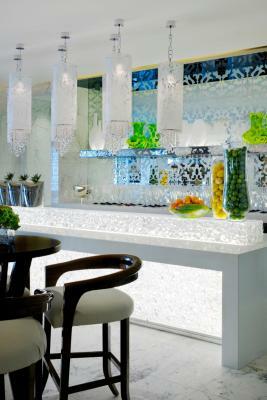 It’s very relaxing and very beautiful and very well designed and decorated. We travel everywhere in the world but we were really impressed by this hotel. The restaurants are amazing, especially the French ‘Zest’. The place, the food and everything is more than excellent. A special note to our representative “Nick”, he was very helpful and the smile on his face makes me want to talk to him all the time. All the staff was very polite, friendly, helpful and always greeting and smiling. The service at the pool is also very nice. The only thing that let this otherwise amazing hotel down was the staff. The truth is MOST of the staff members were simply fantastic, however as always a few bad apples made us feel a little cheated at £2000.00 a night. Few examples: 1. We mentioned to a staff member that the grapes in the fruit basket were mouldy, instead of a simple apology which would have been utterly sufficient, we were told “oh the grapes are very fresh, they can become mouldy overnight”. Sorry but no. Fresh healthy grapes do not become mouldy (and by that i mean full on white hair!!) in an air conditioned room (21-23 degrees) over night. Like most people, I am completely tolerant of occasional oversight but NOT silly excuses that insult my intelligence. 2. Prior to our trip we enquired about recreational activities for my little one, we asked questions such as “does the hotel provide beach toys like little plastic baskets/spades” amongst others. The emails were never answered. I dropped my daughter off at the kid’s club twice, both times for 1-1.5 hours. The kid’s club activity schedule on the printed leaflet were never followed. It seemed like in the mornings only 1 member of staff was available, in the afternoons maybe 2. If you have a few kids from age 4 to maybe 10 doing different things at the club, let’s be honest, 1 staff just isn’t going to cut it, especially if she is on the phone all the time! I do however need to mention here that the manager for recreational activities really stepped up after these issues were brought to his attention - only if everyone is like him then we would have rated this place a 10/10. 3. It was extremely evident that some staff were just after tips. A few of them stopped proactively offering help/service because they did not see me tipping. Shockingly, after I tipped some of them (£5-£10), they made me feel I did not tip enough. Beautiful hotel. We went during school holidays, at apparently 90% occupancy we never felt crowded. Ideal for families and those looking for peace and quiet/privacy. Beach was always quiet which was amazing. I don't think there was anything we didn't like. Fresh fruit in our room and chocolates, what is there to complain about. sorry can't really fault much, we were very spoilt. Maybe explain at breakfast that we can order from a menu as well. First world problem. Amazing bed, got an upgrade loved it.Staff amazing, couldn't faulty a thing definitely going back soon.Cool water by the beach was very much appreciated. Little things like pool boy cleaning your sunglasses, great idea. Loved the adult only pool. Loved my medical pedicure, best i have ever had. The absolute best of the best! The hotel, its staff, its facilities are luxurious and will guarantee that your stay here is more than comfortable. It was a delight to stay here and we will be back!